I'm sure you're already aware that I'm a bit of a Christmas fan. I happen to love wrapping presents, Christmas light displays and decorating the house but what I love most of all is Christmas music. I have a bit of a collection and each year I try to get some more to add to it. This year I've been very smart and categorised the Christmas music to make playlists for the mood I'm in. I've got background Christmas, alternative Christmas, rock Christmas, up beat Christmas, my favourite Christmas songs and of course an all Christmas playlist. Is that normal? ...Don't answer that. 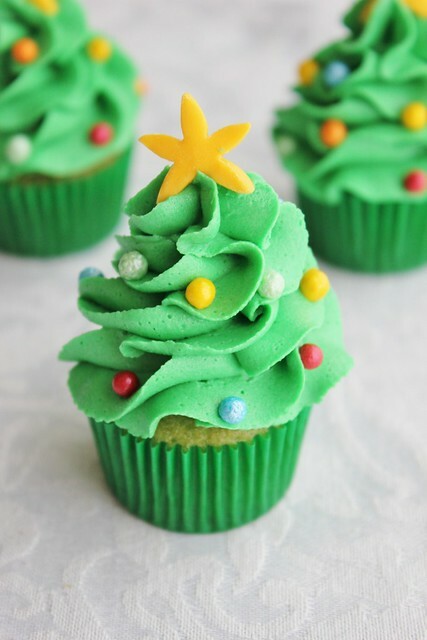 This year I decided I wanted to make some cute Christmas tree cupcakes. I had some left over cake batter from a cake I made earlier this week so I decided to make mini cupcakes, not knowing what I would make with them later. Now was my chance to try out the Christmas cupcakes! 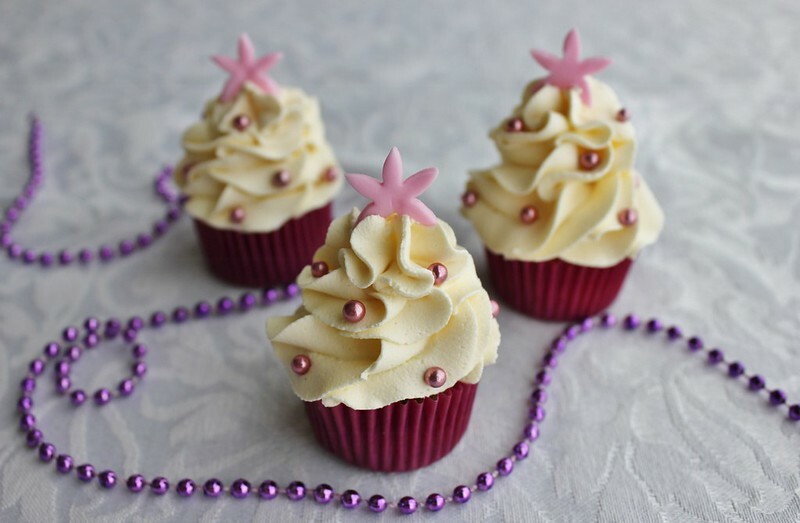 There is something so comforting about decorating a cupcake for no real reason, that is to say, no one asked me to make these cupcakes for them, I just felt like it! What made it even better was the cheerful sound of Christmas carols in the background. I managed to get through every playlist! 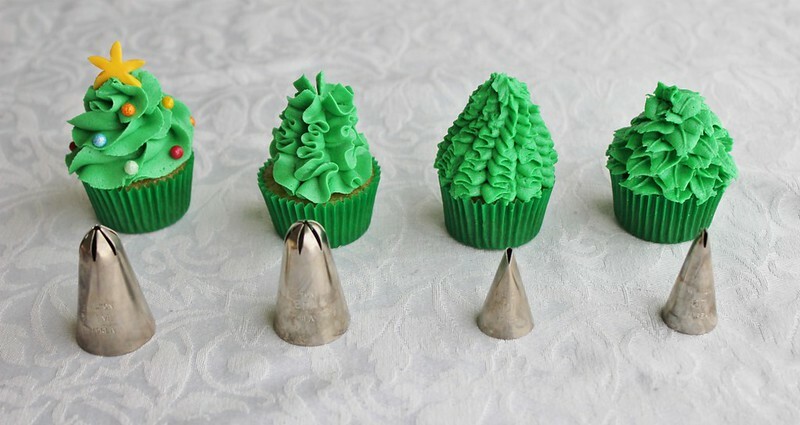 These mini Christmas tree cupcakes were super easy and fun to make. 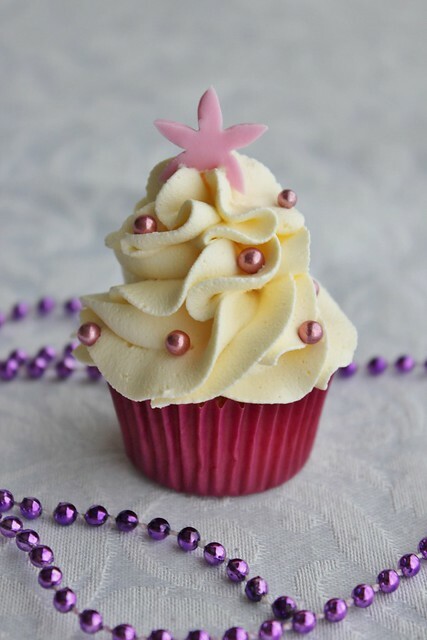 All it takes is some buttercream icing, piping bags, tips and sprinkles. I found you can be as creative as you like, as I experimented with different tips I found there was more than one way to pipe a tree! 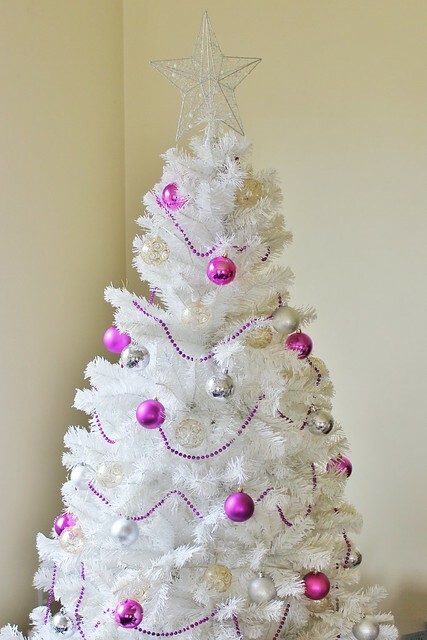 For the white trees I used a Wilton 1M tip. I piped a swirl which overlapped three times and I pinched the top of the icing with my fingers to make the top look like the top of a tree (rather than a squashed tree). I then carefully placed pink cachous around the icing swirl and cut out a star (well, I didn't have a star cutter so I had to use a flower) out of fondant and stuck that on top. I quite liked making these cupcakes white and pink because it more closely resembled my tree (pictured above) than the green ones! For the green trees I used a Wilton 2D which didn't make much difference (not to me anyway), I was just too lazy to wash my 1M. I basically did the same as the pink trees only I used coloured sprinkles I found in my supermarket yesterday that took my fancy. Then of course cut out a yellow "star" for the top. For my experimental trees I used three different tips. The first one (on the left) was the 2D tip again, this time I just squeezed it until it formed a cone shape. It is a bit messy but if you don't have a lot of time this is the way to go, it was so fast! The second one (in the middle) was piped with a 101 ruffle tip. I put a fondant cone shape on top of the cupcake then piped the icing using a ruffle style (this tutorial is great). 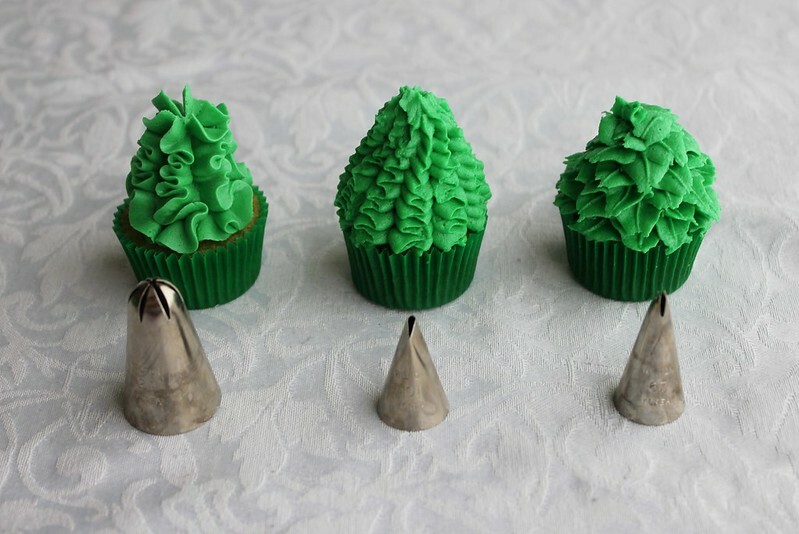 The third cupcake (on the right) I piped using a 67 tip (leaf tip). Pipe with the open side of the tip horizontal in small squeezes, when you let go it will look a bit like a leaf. You can pinch the ends together to make it look more like a leaf. Though I really like this technique I don't think it works well with buttercream because it is too soft, I've used it before on these wreath cookies and it looked great in royal icing. 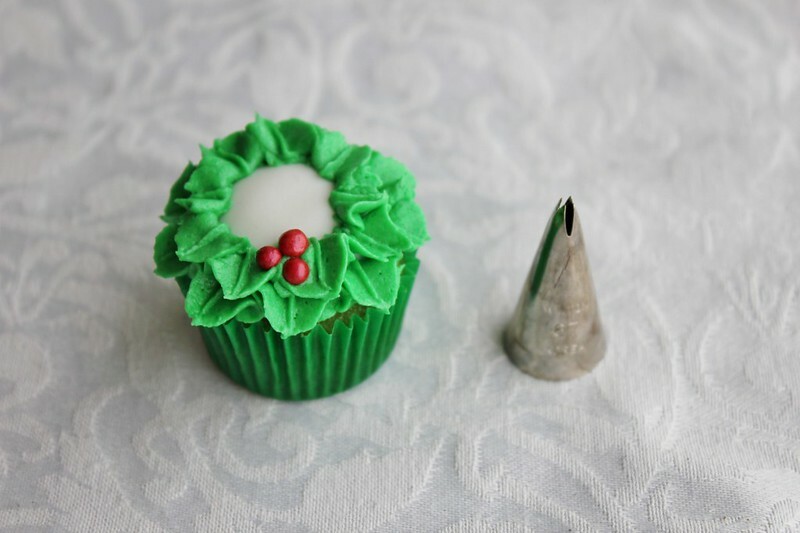 While I was having fun experimenting with different tips I thought I would try make a teeny tiny wreath cupcake. I cut a small circle of white fondant and stuck that to the cupcake before piping the leaves. I used the 67 tip (the leaf tip again) to pipe around then added some red sprinkles to look like berries. I think it's quite cute! I can't wait to continue with my Christmas baking this month! Are you planning on baking up a storm this month? 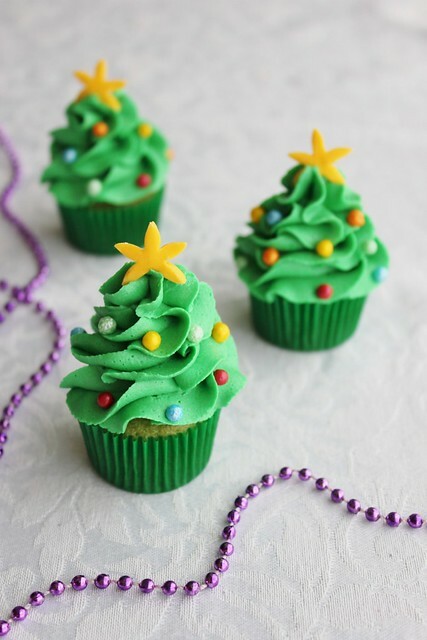 What Christmas baking have you got planned? ohmygoshhh these are so cool!! I think i have found my match with christmas music loving! All i do when im doing xmas baking is listen to xmas music on repeat and repeat! I bake little cookie hampers for christmas each year for everybody :) festive shaped cookies & yummy spiced nuts nom nom! Cant wait to get started on it! Thanks Cloe! I think I'm going to take a page out of your book this year, might make baking hampers for everyone too. You're so talented, I love these. I think you need to have patience for the icing (something I'm a bit short on!). These are awesome, I love the ruffle tip! Thanks Kirstie! Yes I wish I had experimented a bit more with the ruffle tip, I should have decorated those trees too! Doh! Thanks Alessandra, I decided to enter my mini gingerbread houses instead! Haha! 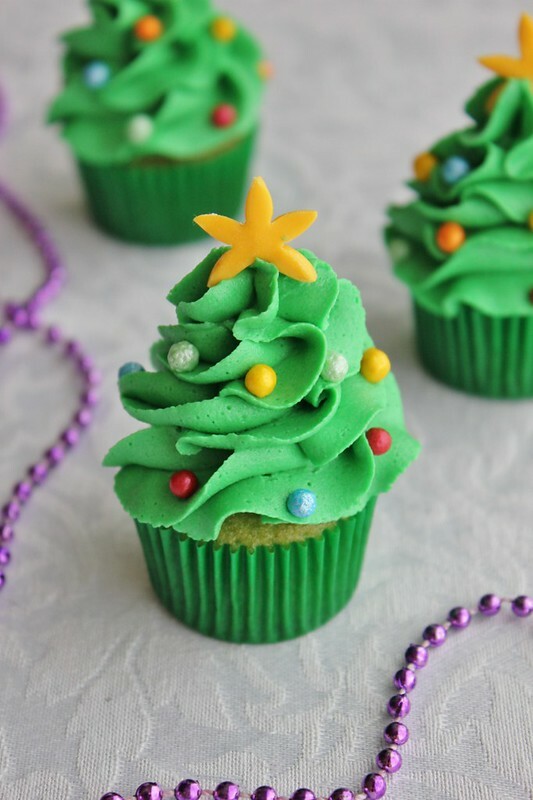 I am writing a story for Delish.com about mini Christmas desserts and would love to use a photo of your Mini Christmas Tree Cupcakes in the piece. I will credit you and link back to your site. Our story featuring your recipe may also be featured on our sister sites such as Countryliving.com, Womansday.com and others, which will mean even more exposure. Let me know if that's OK! Thanks! Hi, Yes that's fine, thanks for asking!